The North Eastern region of Brazil's struggle with climate change is an example of drought degrading the population’s ability to sustain themselves in a region. This history of periodic droughts is gaining in severity, targeting the region’s social and political structure, economics, demographics, and culture. In combination with societal pressures, climate change's ‘aridization’ of the region continuously pushes the region's carrying capacity and is slowly causing civil conflict within the states. Brazil’s northeastern states aren’t strangers to drought, as the region has recorded experiencing drought as early as the 1500s (Sun). Drought occurs about once every ten years and they can last between three to five years (Gaspar). For centuries the region has depended on a three to five month rainy season to sustain the agriculture and society. In states like Ceará, about 92% of families do not have access to irriation therefore they depend entirely on naturral rainfall (Sun). In the past few decades droughts have been more frequent and severe. In the past two years there hasn’t been enough rain to sustain neither agriculture nor society. These dry conditions have worsened for the entire region. Its possibly that humans have grown to push the carrying capacity of the region or that the capacity is deteriorating below their feet. The region fosters agricultural activity varying from cattle ranching to crop farming. But, northeastern Brazil is home to 28% of Brazil’s population and the poorest people in the country. Their growing inability to self-sustain and produce crop for profit influences the decision to migrate for better prospects. The lack of agricultural output pushes the region to fall into the woes of famine and water scarcity. With water as the central element of life, the scarcity of it deteriorates the human necessities to sustain life like agriculture, soil fertility and water sources. So, for those who chose to stay face the increasing death rates of the region or slip further into poverty. Brazil has a high disparity between income and social inequality. The rich have better access to resources; particularly water because they can afford it, versus the poor who suffer without. The government funds the distributions of water, but the resources are limited and not all can gain access to it because they are not centralized, living spread out in rural regions. Therefore, there is a division between the ‘haves’ and the ‘have-nots’. Though the region has been dealing with the effects of drough for centuries, the worsening conditions because of human action and climate change could create a hostile environment much different than droughts before. Agricultural failure contributes to low economic gains, maldistribution of vital resources, increasing poverty and social inequality all lead to conflict in the area. The effects are not immediate, but gradually the depression of the area could lead to violent civil conflict. Droughts are cyclic, not constantly occurring in the region, but reoccurring with varied severity from time to time. The region’s subtropical and semi-arid climate with drought occurrence has been recorded since the Portuguese settlement of Brazil in the early 1500s (Sun). 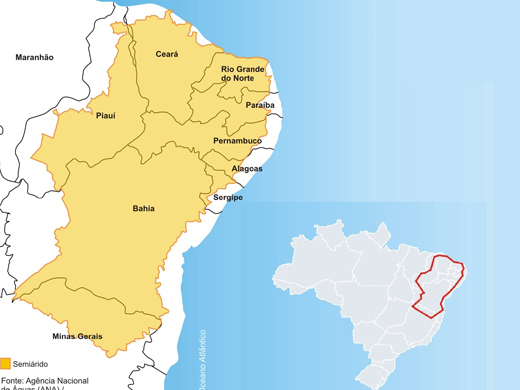 The North Eastern Region of Brazil consists of 9 states: Maranhão, Piauí, Ceará, Rio Grande do Norte, Paraíba, Pernambuco, Alagoas, Sergipe and Bahia. Despite the climactic conditions of the region, people have lived in Brazil’s northeastern region since the 1500s and those native to the land have lived there even longer before that. For centuries people have lived and developed a society in the semi-arid and extremely drought prone region. A majority of those living in the region are sharecroppers on large estates, or at least, participate in agriculture. The interior of the northeastern states is where people are most vulnerable to drought. The area is extremely rural and home to some of the poorest citizens (Rose). These people have been subject to continuous droughts over centuries. Sometimes adaptation to their surroundings just isn’t enough when droughts sustaining years come around. Historically, to mitigate the effects of the drought Brazilians have migrated to temporary and federally funded work camps in the drought area, consolidating their efforts. Other options were to migrate temporarily or permanently to the larger cities within the state or to migrate out of the dry region and further south (Rose). Factors like climate change have impacted the environment gradually, but human actions within the region have also had a great impact. Brazilians have worsened the already dry and arid situation by burning vegetation and agricultural pressure (Gaspar). The semi-arid areas are expanding because of human actions, making them a factor of why the region is has become increasingly arid and difficult for people to live in. The droughts and agricultural failures in the region due to the dryness socially impact the people living there. They experience hunger and lack water for survival. Popular rebellions have emerged because the extremely poor are in an even more so vulnerable position in the region (Osava). Continuous drought and its negative effects on the region’s agriculture and economics can push the people to desperation and conflict over the few resources that are within their reach. Crops fail and livestock dies off, soil dries up, resources are put towards human survival, people are conserving more and prices are put on water, if there is any left. Although there is not as much that Brazilian people can do to change lack of precipitation and its impact on their lives, the Brazilian government has and continues to provide aid and improve the social effects that ensue with drought. This allows the government to help control the suffering and conflict in the area. Discontent and desperation are bred in the face of starvation and dehydration, and agricultural failure. These conditions push people to migrate, or to even rebel against the state (Osava). During the current drought, the government has distributed free water to the public for those who cannot afford to purchase private water. Yet, supplies are limited and disappear very quickly (Severe Drought Plagues Northeast Brazil). To provide for the future of the region and to ameliorate the effects of drought the government has plans to re-rout the São Franciso River. A grand plan, which will improve the water supply for at least 12 million people in the Northeastern region, and possibly allow for agricultural irrigation (Osava). The government also created the Inspectorate of Works against Droughts. Its purpose is to combat the effects of climate changes and to provide better access to water. Results of the program are new roads, dam projects, artificial lakes and wells, all of which create support for the region’s agriculture and ability to surpass the effects of drought (Gaspar). Climate change is increasing the area of semi-arid and arid land in the Northeast region. Essentially, the entire amazon region is experiencing aridization. By the year 2050 the IPCC defined Amazon region, consisting of territory from Rio de Janeiro, Brazil to the coast of Venezuela, and from far eastern Brazil to the western tip of Peru, will fully experience the effects of regional drying due to climate change (Lee, 100). Temperatures are expected to increase and precipitation zones will be shifted (IPCC FAR (2013), 6-66). Dry seasons are projected to be much longer, which will deepen the impact of droughts in the northeast (IPCC FAR (2013), 12-81). Rain will move over the Amazon rainforest, regions such as the Northeast will become hotter and dryer. There are about 50 million people living in the Northeast. Their growth pressure and the footprint of development further push the capacity of the region to carry everyone. Only 30 percent of the regions population is not involved in agricultural employment (Rural Poverty in Brazil). The pressure of the rural poor to push the land for more productivity degrades the soil and fertility. Productivity is low because of the severe absence of water and irrigation, yet the people continue to farm until they have no other option. Livestock too demands pressure on the land, requiring land to graze, which is degraded and high water inputs. The region varies between tropical, sub-tropical, dry and semi arid (Sun). The act and harm sites are the 9 states in the North East Region: Maranhão, Piauí, Ceará, Rio Grande do Norte, Paraíba, Pernambuco, Alagoas, Sergipe and Bahia. Climate change and human pressures within the region is causing airdization to spread through out the region. States are handling conflicts individually with help of the government’s distribution of water and efforts to increase availability. Issues are arising out of class inequality and mal-distribution of resources, and the shortages of resources. Agricultural and livestock failures are leading to economic depression, and climate change is forcing migration off of unproductive lands. The primary trigger to conflict in the region is resource access. There is a drought in the already dry region that is impacting agricultural and livestock productivity. Inability to access water is either one's inability to pay for private water, or the inability to reach or access government provided water. Deaths arise from starvation and dehydration. So far there is no outright violent civil conflict in the region leading to substantial death counts. There is just struggle with the climate and economic circumstances. There is no immediate action that caused the environmental changes and enhanced the severity of droughts in the Northeastern region. Human pressures of agriculture and development, water demands and natural climate change, which increases aridization amplifies the effects of existing drought-prone conditions and climate. The conflict is started by the amplification of natural changes through decades of human action creating water scarcity and agricultural failure. Conflict is indirectly started through inability to access or pay for resources, preferential treatment, which is bred from corruption and social status. This diagram contains two variable categories: agricultural variables, which are represented in green, and socioeconomic variables, which are represented in orange. 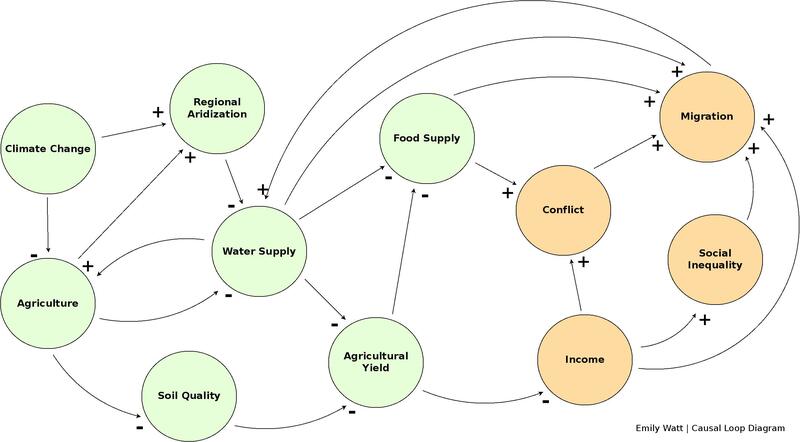 The main connecting variables between the two categories are, water supply, food supply, agricultural yield and migration. Climate change, particularly in the form of regional aridization, sets off an agricultural disaster in the North Eastern Region, which negatively impacts the region’s water supply and agricultural yield, consequently impacting the connected socioeconomic factors. The increasing aridization of the region in combination with agricultural practices decreases the water supply more than usual. Additionally, the droughts due to climate change disrupt the replenishing water cycle. Thus, the scarcity of water diminishes agricultural yield through the inability to sustain agriculture, and subsequently reduces the food supply. These factors that lead to a low food supply eventually force citizens to migrate or stay. Those who stay face conflict over the limited resources. The low water supply and degraded soil quality both contribute to the reduction of agricultural yields. This agriculture dependent region strives on high yield. A reduction links to income of the region. The inability to sustain agriculture, for a profit as well as sustaining human life, directly leads to an increase in regional poverty. This causes a disruption in the cycle of earning money to pay for the next growing season, placing farmers into poverty or debt. Poverty too leads to conflict. The struggle to pay for and to gain access to food and water sources or even to pay for another harvest can cause desperation and violent means of getting these resources. Perhaps the most significant variable is migration. Many of the variables: income, water supply, food supply, conflict etc. all lead to migration. Migration is often the end result variable. The harsh conditions brought on by climate change create an unfavorable place to live and work. Although, the increase in migration can relieve the pressure for resources on the area, reducing conflict. Overall, the effects of climate change reduce the North Eastern region’s capacity for agriculture, which it heavily depends on. Consequently, the failure of agriculture and inability to human life sends socioeconomic factors into a downward spiral. These are the challenges that the North East faces. Their increasing pressure on the environment and regional effects of climate change are changing the climate of the region, making it less habitable and less suitable for agriculture. The government and civilians are the primary actors affected by the droughts and climate change. The climate change and droughts are exclusively in the Northeastern region, since the state is extremely diverse in terrain and climate. Brazil has particular interest because the region is home to some of the country's poorest people and one third of the population. Two thirds of the region participates in agricultural employment and relies on natural rainfall for water irrigation (Rural Poverty in Brazil). An entire region in turmoil, it is significant to resolve the agricultural, social and economic issues before the state’s poor are pushed even further. Some of the first records of the region report harsh droughts and a semi-arid region. Yet, for centuries people have settled and developed the region, further pushing the environmental capacity and aiding the effects of climate change. They have experienced constant regional turmoil in forms of social struggle, starvation, lack of water and food and agricultural failures. The conflict and environmental pressures are still continuing and are expected to progress along with the development of society and continued pressure to receive more form the land. The Land Conflicts between Grileiros and Peasants in Pará, Brazil case specifically focuses on illegal logging and the civil and legal unrest surrounding it in Pará, Brazil. It is highlighting the fight against illegal logging on local peasant’s land on behalf of grileiros. Those who oppose their illegal activity are murdered or threatened to death, yet most of these cases are not judged (Molinari). This case is similar in its identification of deforestation as a key actor in climate change, but it goes further to identify the human cause behind the state’s climate change and violence and the illegality of the circumstances as well as the violence and civil unrest because of it. The Amazon Battle: Dams Conflicts case focuses on two dams that’s are subjected to much critizism in Brazil because although they will provide green energy they will be displacing thousand of indigenous peoples living in the area and degrading the natural environment’s biodiversity (Maisonet-Guzman). This case aims to uncover the social injustices, the search for green energy, and social tensions over resources between incoming migrants and the resident indigenous communities. This case is also similar pinpointing the human caused climate change amplifying regional conflicts and environmental degradation. Yet, it is different in its specification of man made dams, focus on indigenous peoples and civil conflict. The Cocaine, Conflict and Environment case views the coca and poppy cultivation as an agent for environmental degradation via deforestation, erosion, chemical pollution, and it connects to the drug trade in the Andean jungle, relating to violence and illegality (Cocaine, Conflict and Environment). This case takes a very different approach to climate change by looking at the effects of drug cultivation and trade and its impacts on the environment, which is usually only analyzed by its social effects. Although these three cases can relate to this analysis of the Amazon region, they have a more specific analysis of the social effects on the region and those human impacts on the environment. They commonly highlight civil conflict and take the perspective on environment and conflict further with cases that highlight ongoing issues in the Amazon region, specifically deforestation. Brazilian Flag State Outline. Digital image. Canada - Brazil Exchange 2013. N.p., n.d. Web. 12 Dec. 2013. <http://www.horton.ednet.ns.ca/Activities/Canada-Brazil%20Exchange/Brazil_flag_map.png>. "Cocaine, Conflict and Environment." International Conflict and the Environment (ICE). American University, n.d. Web. 15 Nov. 2013. <cocaine.htm>. Dias, Manu. The Federal Government has programs, like Bolsa Estiagem and Garantia Safra, to help people who live in emergency areas. Digital image. Infosurhoy. N.p., 4 Aug. 2013. Web. 13 Dec. 2013. <http://infosurhoy.com/en_GB/articles/saii/features/main/2013/04/08/feature-01>. Gaspar, Lúcia. "Drought in Northeast Brazil." Funda��o Joaquim Nabuco. Fundação Joaquim Nabuco, 6 Aug. 2009. Web. 12 Dec. 2013. <http://basilio.fundaj.gov.br/pesquisaescolar_en/index.php?option=com_content>. Graphic of the North Eastern States of Brazil. Digital image. WikiTravel. N.p., 1 Aug. 2011. Web. 12 Dec. 2013. <http://wikitravel.org/en/Northeast_(Brazil)>. IPCC FAR (2013), Stocker, T., Q. Dahe, and G.K. Plattner, ed.. Climate Change 2013: The Physical Science Basis, Contribution of Working Group I to the Fourth Assessment Report of the Intergovernmental Panel on Climate Change, Cambridge University Press. Kunshen, Evgeny. Turkey Screensavers Screensaver 1920 X 1080. Digital image. CulLogo. N.p., 25 Jan. 2013. Web. 13 Dec. 2013. <http://cullogo.com/turkey-screensavers-screensaver-flag-brazil-1920x1080/>. Lee, James R. Climate Change and Armed Conflict: Hot and Cold Wars. London: Routledge, 2010. Print. Map of Northeastern Brazil's Semiarid Region. Digital image. Infosurhoy. National Water Agency/ Ministry of Integration, 4 Aug. 2013. Web. 13 Dec. 2013. <http://infosurhoy.com/en_GB/articles/saii/features/main/2013/04/08/feature-01>. Maisonet-Guzman, Olimar E. "Amazon Battle: Dam Conflicts." Inventory of Conflict and Environment (ICE). American University, Dec. 2010. Web. 15 Nov. 2013. <amazondams.html>. Molinari, Laura J. "Land Conflicts between Grileiros and Peasants in Pará, Brazil." Inventory of Conflict and Environment (ICE). American University, Aug. 2005. Web. 15 Nov. 2013. <parana.htm>. Osava, Mario. "Living Laboratory for Coping with Drought in Brazil." Inter Press Service. Inter Press Service, 4 July 2013. Web. 12 Dec. 2013. <http://www.ipsnews.net/2013/07/living-laboratory-for-coping-with-drought-in-brazil/>. Rose, Newton. "A Persisting Misconception About The Drought Of 1958 In Northeast Brazil." A Persisting Misconception About The Drought Of 1958 In Northeast Brazil. Old Dominion University, 12 Mar. 1979. Web. 12 Dec. 2013. <http://projectceara.arizona.edu/sites/default/files/drought%201958.pdf>. "Rural Poverty in Brazil." Rural Poverty Portal. Rural Poverty Portal n.d. Web. 10 Dec. 2013. <http://www.ruralpovertyportal.org/country/home/tags/brazil>. "Severe Drought Plagues Northeast Brazil." Aljazeera. Aljazeera, 22 July 2013. Web. 13 Dec. 2013. <http://www.aljazeera.com/weather/2013/07/20137226213193690.html>. Sun, Liqiang, Huilan Li, M. N. Ward, and David F. Moncunill. "Climate Variability and Rainfed Agriculture in Cear� Brazil." International Research Institute for Climate Protection. Columbia University, Mar. 2005. Web. 12 Dec. 2013. <http://iri.columbia.edu/~lhl/crop.pdf>.